Synopsis: Five months ago, Camryn and Andrew, both dealing with personal hardships, met on a Greyhound bus. They fell in love and proved that when two people are meant to be together, fate will find a way to make it happen. Now, in the highly anticipated sequel to The Edge of Never, Camryn and Andrew are pursuing their love for music and living life to the fullest as they always swore to do. But when tragedy befalls them, their relationship is put to the ultimate test. As Camryn tries to numb her pain, Andrew makes a bold decision: To get their life back on track, they’ll set out on another cross-country road trip. Together they find excitement, passion, adventure-and challenges they never could have anticipated. My review: When I found out that I had been granted permission to read and review and advanced copy of this on NetGalley I was so excited! I loved the first book, The Edge of Never, and this one also did not disappoint! 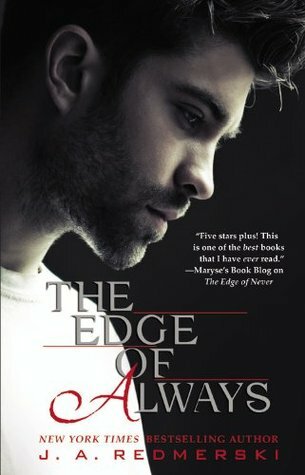 While The Edge of Never was filled with romance and passion with a smidge of heartbreak, The Edge of Always rivaled all that by throwing in deeper emotions of love and loss. I genuinely felt sad for Camryn and Andrew and all that they went through in these 400 some pages. When they triumphed and overcame an obstacle I was cheering along with them, and when they sank down and felt defeated, I mourned with them as well. I think it’s really up to each individual reader to decide whether or not this was as good as the first book. I for one thought The Edge of Never was better, but this one was a good ending for Camryn and Andrew’s trials, tribulations, and travels. So, if you disregard that the ending was a little bland, the beginning and middle of the book more than make up for what the ending was trying to accomplish (closure, I guess? The author was just giving way too many over the top descriptions of love, even for me to handle). Overall, a wonderful ending to the duology and was something that I greatly anticipated to read and now am glad that I have finished it!